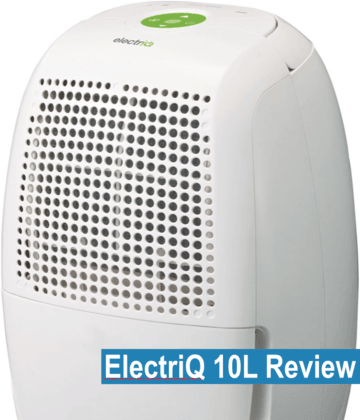 ElectrIQ are a new UK domestic electronics brand and the 10L ‘CD10L’ is their most popular dehumidifier. This appliance is aimed at smaller homes or for individual rooms, like a conservatory. 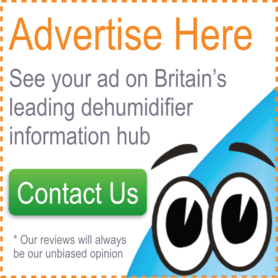 While it could hardly be described as cheap, this is still a budget dehumidifier. 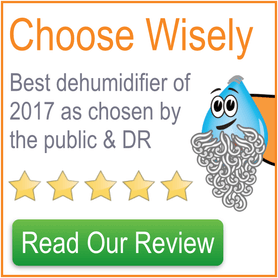 We’ll be comparing it to the De’Longhi DEM10 and the EcoAir DC12, which are similarly priced refrigerant dehumidifiers, but have a history of good reviews and are recognised brands. Dive into our ElectrIQ 10L review to find out whether the machine is a wise purchase. Let’s begin by looking at the control panel. Lights up red when the water collection tank is full. The CD10L will stop dehumidifying automatically when this occurs, so there is no chance of an overflow. Green indicator light that illuminates when the continuous/ laundry mode is on. 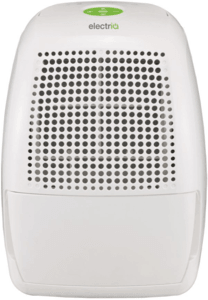 In this mode the ElectrIQ 10L will dehumidify non-stop, no matter how low the humidity gets. By driving the humidity as low as possible, increased evaporation will occur from damp laundry, walls or furnishings, which quickly drys them out. Laundry can be dried in under two hours on this setting, making it a useful time saver. You could also use this setting in times of increased humidity, such as after showers or cooking. This mode will lower the humidity of the home more quickly than the standard settings. 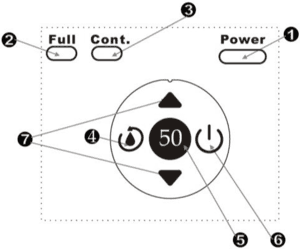 Continuous/ laundry button. Press this button to trigger the continuous/ laundry mode. Be careful not to leave this setting running longer than a day or two or you risk driving the humidity too low and/or damaging the CD10L. Press the button again to cancel the mode and return the machine to standard dehumidifying. LCD display showing your desired humidity level. Up/down buttons to control the desired humidity level. Use these buttons to set the relative humidity between 35% and 80%RH. This controls the humidistat, which stops the machine from dehumidifying when the desired humidity is reached, thereby saving energy. ElectrIQ recommend that you set the machine to 50%RH and I see no need to deviate from that. In addition to the features discussed above, the ElectrIQ 10L comes with a silver ion filter. Silver kills bacteria and other harmful microbes upon contact, so it makes a great addition to this appliance. The filter itself looks like a standard dust filter with a silvery coating and is easily cleaned by giving it a going over with a vacuum cleaner every few weeks. The dehumidifier only comes with one fan speed. Having two fan speeds gives the variation between power when you need it and quietness when you don’t. So it’s a shame not to see it on the CD10L, but not unexpected for a machine in this price range. The front-loaded water collection bucket is pretty small at 1.5L. In this class you’d hope for at least 2L, but I wouldn’t let the 500ml difference be a deciding factor. Irritatingly there’s no way to tell how much water is in the bucket without opening it, so you end up relying on the ‘full’ light on the control panel. There’s no lid or handle on the bucket, so you must be very careful not to spill the collected water while tottering over to the nearest sink. Thankfully there’s the option for continuous drainage should you be able to position it above an appropriate drain. The ElectrIQ 10L weighs 10.5kg, which is about average for a refrigerant dehumidifier of this power. The appliance sits on castor wheels, so thankfully you can roll it rather than having to lift it up, should you need to move it. If you need to lift it up then there’s a chunky carrying handle that folds out of the top of the unit. The egg-shaped appliance measures 33.5cm wide by 28.0cm deep by 43.5cm tall, which is roughly on a par with the other dehumidifiers in its class. The ElectrIQ CD10L, with the white and green colour scheme coupled with the circular holes of the outflow vent make it look quite modern and it certainly doesn’t give away its low price tag. This isn’t a particularly quiet machine, producing 48dB of sound, which is slightly worse than competitors. Having one fan speed doesn’t help in this regard as there’s no way to reduce the noise when you’ve had enough of it. I wouldn’t want to keep this in the room that I watched television or in the bedroom, but if kept in a hallway or conservatory the sound doesn’t carry far enough to be a problem. While ElectrIQ claim that the CD10L will extract 10 litres of water per day, remember that they qualify this by saying that it was measured under conditions of 90%RH and 30°C. These are ideal conditions for moisture extraction and as the temperature and humidity drops, as with all refrigerant dehumidifiers, the extraction rate falls like a stone. While it’s impossible to say how much moisture it will extract in your home, compared to the competitors in its class, the ElectrIQ tends to extract slightly less, but not significantly so. I would rate this dehumidifier as powerful enough for a small three bedroom house. To briefly summarise the above, while the ElectrIQ 10L isn’t outstanding, you won’t go far wrong with it. At the RRP of £127.97 (at the time of writing) you’d be better off with an EcoAir DC12, but at the sales price seen at THIS SHOP the CD10L represents good value.